The Pukaha Mount Bruce National Wildlife Centre is a nature conservation reserve, established in the early 1990s as a centre for environmental education and to promote awareness of New Zealand’s indigenous wildlife. Since its establishment, substantial recovery of the forest has been achieved through pest control, reintroduction of wildlife and revegetation – largely carried out by community and iwi volunteers. In 2001, the Pukaha Restoration Project began through a partnership between the Pukaha Mount Bruce Board, the Department of Conservation and Rangitane o Wairarapa. In 2014, Boffa Miskell was engaged to lead a review of the project. The resulting report records the project’s successes and outlines recommendations for the future, including recommendations on animal pest management and visitor experience development. You can see the report here. Amongst the recommendations in the report, improved connections between the forest restoration project and the wildlife centre’s breeding programme were suggested and a strategy was developed. As part of this strategy, Boffa Miskell then assisted in preparing a plan that outlined where potential upgrades to the existing track network and way-finding signage could improve the visitor experience. Boffa Miskell also mapped the existing track network at the reserve, which helped inform the siting of a large new aviary and the new connecting tracks required. 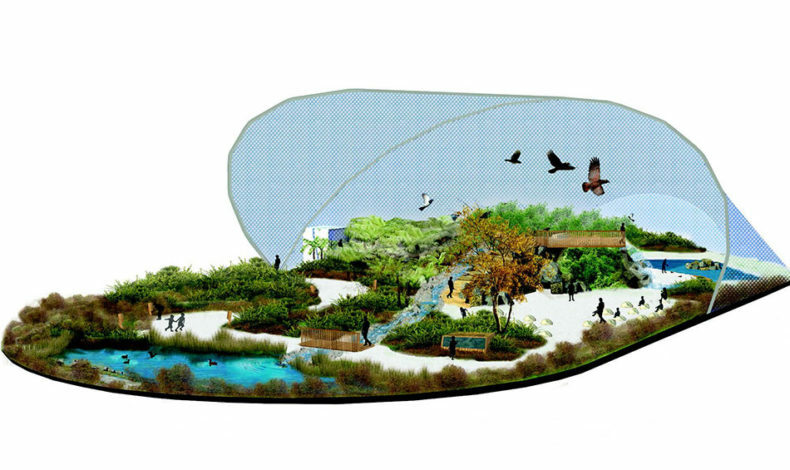 We produced conceptual drawings of the aviary, which opened in May 2016, and the working drawings for the aviary environment, including visitor circulation and specialist planting for bird habitat and visitor interpretation. Native birds, representing a number of rare or iconic species, move freely within the 40 by 20 metre forested space alongside visitors. Breeding pairs of some rare species are also resident in the aviary so that they can safely raise chicks. These young ones will eventually be released into the wild as a further step in the forest restoration project.